The Office 365 for IT Pros team has scattered to the four winds and are now en route home to Ireland, the U.K., Finland, and Norway. Paul Robichaux flew his own plane home to Alabama yesterday after recording an episode of the Office 365 Exposed podcast, where we were joined by Greg Taylor, Director of Marketing for Exchange and Exchange Online. We recorded the show in one of the “pop-up” booths in the Community Central area of the Ignite hall, and the team who took care of us did a great job of generating audio and video feeds. Paul is processing the audio feed for iTunes and the video will be on Practical365.com soon. Stay tuned. Before we recorded the podcast, Paul took some folks on a quick dawn tour over Orlando. It was great fun! Ignite 2018 was a good conference. There were downsides, like flaky wi-fi connections in the exhibition hall and session rooms, and the food was so-so (IMHO), but really good content was shared with attendees. The problem some might have is to separate the content they can use today from announcements of directories and features that Microsoft will deliver at some point in the future. Ignite is a kind of launchpad for Microsoft to describe where they are going and what to expect over the coming year, and it’s important to always keep this fact in mind when listening to sessions. Some complained at the technical level of sessions. I thought this was unfair. Sure, not every session was at 300 or 400 level, but there was more than enough good technical information available for people to justify their attendance. And anyway, the best thing about events like Ignite is the chance to meet people, reinvigorate connections, and learn from each other. You can always catch up on the sessions later, which is what I will be doing over the next few weeks. … and then download the content! The Exchange product group was kind enough to buy 500 copies of Office 365 for IT Pros to giveaway at Ignite. Anyone who stayed right to the end of an Exchange session had a chance of getting a free book, and the offer seemed popular. All the free copies are gone now, but feel free to buy your very own copy here. Microsoft has announced they’ll be running 17 “Ignite on Tour” events around the world, starting in Berlin in December. There’s no news yet as to exactly what content will be presented at these events, but you can expect that many of the sessions will focus on delivering the latest news about Microsoft technologies. As is the norm, Microsoft announced the date and location of the next Ignite conference at the end of this year’s event. No one was surprised to hear that we are going to be in Orlando again, but the news that the event is moving to later in the year was. November 4-8 seems like a better choice as Orlando should be less humid and hot. Pre-registration is now open for the 2019 event. It’s definitely an event worth considering. 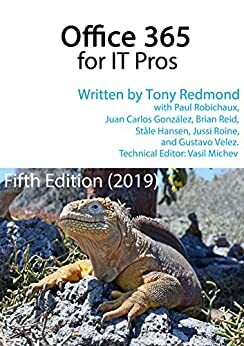 If you can’t get to Ignite and don’t want to review all the Office 365 content shared at the event, why not invest less than $1/week (based on $49.95 for a subscription to a yearly edition) and buy a copy of the Office 365 for IT Pros eBook? We do the work of sifting through Microsoft’s announcements, identifying what’s important, and documenting it in practical terms. That seems like a good thing. And $49.95 is a lot less expensive than the $5,000 cost of going to Ignite (conference fee, airfare, lodging, and other living expenses).